Schooner photo by flickr user anoldent. Are you one of the many people in Bellingham who covets the sailboats on the bay? I know I am! Well, this Saturday, April 16th, 2011, the Old Fairhaven Association will be hosting the Bellingham Bay Rendezvous. 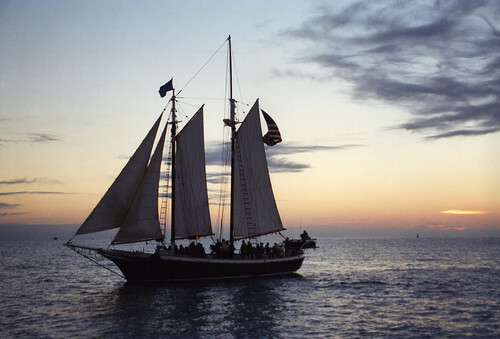 In honor of the Schooner Zodiac officially moving to Bellingham, there will be a celebration at the Bellingham Cruise Terminal on the Fairhaven waterfront from 9 to 4 tomorrow. The Rendezvous will bring historic wooden schooners from across Puget Sound to the Bellingham Cruise Terminal for free, family friendly activities that will include vessel cruises, nautical workshops, antique marine engine demonstrations, kids activities, sea chanties, and food booths, as well as tours of the Coast Guard Cutter Sea Lion and a ceremony to celebrate the Schooner Zodiac’s formal transfer of home port to Bellingham. The event is mostly free, although you can also buy a $10 ticket to cruise for an hour on the Victoria Star on Bellingham Bay, and some ships will be taking pre-ticketed persons for cruises on the Bay. For more info, check out the Bellingham Bay Rendezvous website.